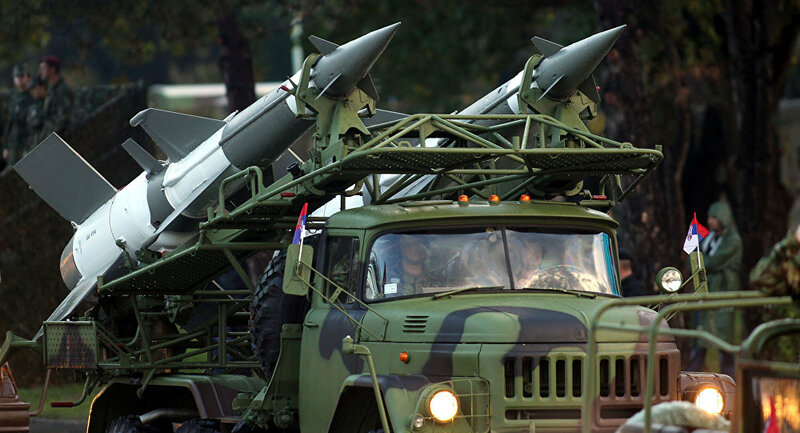 “If someone is crazy enough to make his airspace available to a third country willing to attack Serbia, we have a missile capable of knocking out all major cities in the region,” Miroslav Lazanski, a military observer with the Belgrade-based newspaper Politika, told Sputnik Serbia. Summing up the results of the recent international arms expo in Abu Dhabi, Lazanski said that Serbia had made a serious comeback to become southeastern Europe’s number one arms manufacturer. Serbia offers a wide range of combat gear to potential buyers, ranging from handguns and combat outfits, to UAVs, armored vehicles and artillery pieces. “This means that the Serbian military-industrial complex is back on its feet after 1999 and all NATO did to us by bombing Yugoslavia,” Miroslav Lazanski told Sputnik Serbia. The Sumadija, a surface-to-surface missile capable of hitting targets up to 300 kilometers away, designed and built in Serbia, grabbed much attention during the Abu Dhabi show. “This is exactly what Serbia needed to prevent its regional neighbor’s possible participation in the 1999 aggression against us. The Sumadija can also hit big cities in neighboring countries. “Hopefully no such conflict will ever happen, but if it does and someone is crazy enough to make his airspace available to any third country willing to attack Serbia [like Bulgaria did in 1999], we now have a missile to reach all the strategic cities in the region,” Lazanski warned. He added that the Sumadija is entirely an indigenous project by the state-owned company Yugoimport-SDPR and the private firm Edepro. The missile has a minimum range of 70 kilometers and a maximum range of 300 kilometers. It can operate at air temperatures ranging from 30 degrees below zero, up to 50 degrees above zero. The Sumadija carries a fragmentation, or thermobaric warhead, and takes 12 minutes to launch. — Petar Vojinovic (@petarV) 19 февраля 2017 г. ​Lazanski said that the only foreign missile boasting characteristics similar to the Sumadija’s is China’s WS-2. “This is the kind of missile even former Jugoslavia was unable to build,” Miroslav Lazanski concluded.